Some of the team gathered Saturday afternoon in the hope of getting the week off to a good start with some early mist-netting at Gedney on Sunday morning. There was some doubt due to concerns about the weather, but with some final checks on the wind forecast the decision was made to go ahead. A recce team went out to look at the marsh in daylight to see where to set nets and put out poles. After dinner that included an excellent Pear Upside-Down Cake from Lizzie, Lucy gave the first briefing welcoming everyone and explaining the house-keeping, rules etc (trialling the newly-written notes on how to run a Wash trip). Guy arrived with Victoria, the co-ordinator of the WWRG trips to Delaware Bay, who had just flown in from the States; everyone was pleased to welcome her to the Wash.
Six net-setters rose at the rather early hour of 01:00 hrs and the rest of us got up at 02:30 hrs to get into position on the marsh by 03:30 hrs. Two lines of six nets were set: a horseshoe around a pool and a line of six along the creek. Sunrise was at 05:45 hrs so there was only a small window of opportunity for catching at high tide; we were able to watch birds fly into the nets as dawn came. If we had had another hour of darkness we would certainly have caught more. 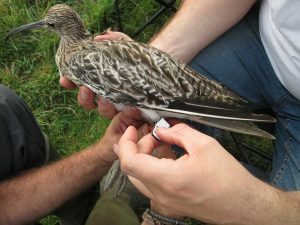 A Whimbrel was taken immediately back to base and ringed and released. After the birds had been processed we returned to base for the first of the Wash’s famous breakfasts and de-brief. 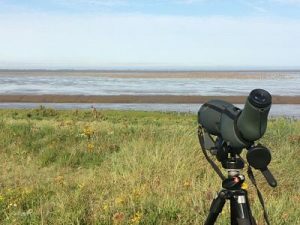 Recce at Snettisham – 250 Sanderling on the beach. No recces had been done on the Lincolnshire side yet; the plan was to do some recces today with the hope of the first catch on the Lincolnshire side on Monday. Two groups went to Frampton and Snettisham to do some colour-ring re-sighting. There was considerable effort made over the course of the week to get colour-ring sightings, Rob P instigated many of the trips and gives a summary of the successful results at the end of this report. The rest of the team arrived during Sunday and after high tide we went to Snettisham and set four small-mesh nets on the beach ready for the morning. It was an early start again but not as bad as Sunday. The team lay in a hollow on the beach rather than behind the sea wall so we could get to the nets quickly as we would be firing into a rising tide. There were lots of birds initially but most of them moved off towards Heacham. Lou was sent off after them but although she located the flock, there was not time to bring them back before high tide. In the end lots of skilful twinkling by Francis, Will and Ron ended with Lucy (supervised by Nigel) taking a small catch of 21 Sanderling, one of which was a retrap. The lift from the water went well and the birds put into keeping cages on the beach. As not many birds were spooked by firing we settled back down to see if it would be possible to fire again on the falling tide but a new ridge had formed a little way down the beach and as this became exposed the attempt was abandoned. The team leaders made the most of the small catch to demonstrate measuring techniques and allow less experienced members to practise head and bill, tarsus and wing measuring. By now it was a beautiful sunny day and we went back for another excellent breakfast cooked by Jacquie and Francis. 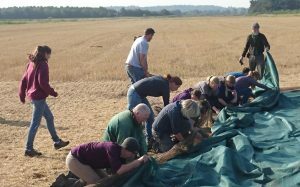 The Lincolnshire team, plus seven members of the Norfolk team, left at 11:30 hrs to help with cannon-netting on Wainfleet Island. In the evening the team left at the field house went to Lawyers Farm, Holbeach and set a large-mesh, narrow, half net to fire from a steep bank over a small pool where Greenshank are regularly seen. The team got into position, Nigel, being unable to move from his position in a very small hollow in hawthorns, had to have his dinner slotted into the hide! Only one wader, a juvenile Greenshank, was sometimes in the catching area along with eight Mallard, one Tufted Duck, three Little Egrets and a Grey Heron. Deciding the net was not in exactly the right place the net was re-set ready for the morning. Most of the team that had gone to Wainfleet returned and met up with the rest at Holbeach for the second attempt on the Greenshank pool. Unfortunately, the tide cut and not many birds came off the marsh, one or two Greenshank were seen but they did not stay. We returned to base and spent some time on other tasks – Tim cleared a path through to the gas tank and started to clear around the compost heap which is becoming rather full of woody stuff. Other people were engaged in maintenance and Francis repaired some nets, showing others how to do the reef/sheet knot that prevents the net mesh slipping. Recce to White Barn – Nigel and Jacquie – Sea wall has not been grazed now for two years which makes walking hard work. Tide cut and no water in pools except for some rainwater; there were a few Redshank. About 1 km further out there were lots of Redshank and a few Curlew. Could be good if we get water in the pools and was left as a definite possible for later in the week when the tide will be higher. Recce at Ken Hill – Gary and Lou – c. 120 Curlew in cattle field. sure the turf was replaced as carefully as possible and then set about gathering grass by hand ready to grot the nets tomorrow morning. After about 20 minutes of crawling around on our hands and knees acting like cows (I was told this was normal for Norfolk) we remembered that there was a brush-cutter in the trailer and Nigel was persuaded to get it going. 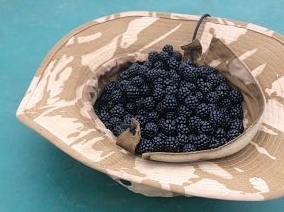 Loads of excellent Blackberries were growing around the field and we wanted to take some back but did not have any containers – until Richard nobly sacrificed his hat! The cattle in the field had shown some interest in our activities; we gently moved them away and waited to check they would not immediately go back to the net area. As we waited in the warm evening sun we were treated to the sight of c. 60,000 knot swirling in the sky above us, fantastic. Before we left a couple of Curlew had already returned to the field. Dinner included some Chocolate Brownies courtesy of Lou with fresh Blackberries and was followed by a briefing on keeping particularly calm and quiet near Curlew to avoid stress. Hide group of eight got up at 03:45 hrs to set by 05:30 hrs. Although the nets were in place the electrics needed doing and there would possibly be cattle trampling to repair. The rest of us got up at 05:30 hrs to be met at the sea wall by Ron with the radios. Despite the early start 30+ Curlew arrived just as they were finishing the set and flew off. With just one or two birds in the catching area people were sent off in various directions to find Curlew – some before they had even reached the field. Back at the catching field, the hide team had to get out to chase off two Marsh Harriers about to settle on one of the decoys. No one could find any Curlew in the surrounding fields, then Nigel spotted a group of about 30 Curlew at the other end of the catching field! Francis was sent off to twinkle and found another group of c. 30 which joined the first, they were lifted again and landed perfectly in the catching area. Lucy held fire until the flock of Starling that were feeding on top of the net moved out of the safety area and then (under supervision) took a nice catch of 66 Curlew. The Curlew and single Bar-tailed Godwit were ringed and processed smoothly; all were adults and quite a 22 were retraps. All birds were colour-ringed and flagged. A few birds with white scheme markers had lost their flags; these were replaced with a new flag from new manufacturer and a new orange scheme marker. With one processing team and two colour-ringing teams the flow of birds through the procedure was kept steady. 12 Starling were also ringed, well away from the Curlew so they didn’t disturb them! Recce to Heacham Beach – Rob R – 04:45 hrs 500 Oystercatcher disturbed by dog walker and moved to Snettisham Beach then on to the RSPB pits. At Snettisham Beach c. 100 Sanderling, another 250 arrived, disturbed by dog walker and moved to Heacham beach. Recce to Snettisham Pits – Rob P & Selina – 100 Curlew, several 1,000 Knot and Bar-tailed Godwits spiralled out onto field behind pits that we have caught on before. Vehicle disturbance made Knot rise up but they re-landed in same place. Decision was to go to Snettisham (Sandringham Estate) to set on field that Rob P had identified. Sanderling at Heacham would be an option for later in the week. The team went out to set nets, Richard and Nigel were extremely impressed with the sheer quantity of bird poo on the field, Richard even took a photograph to show Lucy (!). They decided to set a line of three small-mesh nets and great care was taken to minimize trampling on the recently farrowed field. We created a furrow for the net to lie in; anyone watching would have seen a very strange sight of 20 people inexplicably shuffling and stamping in a long line across the field backwards and forwards (another NFN moment). A lovely afternoon with Golden Plover flying over and Hares in the fields. We went back and had dinner, an excellent aubergine gratin from Jacquie, apple crumble and an early night. Lucy, Patricia and Lizzie had returned from the Lincolnshire side after staying longer than expected and gave us an update on the ringing, various people falling in creeks and Will gallantly buying ladies knickers with the food shop! Sam and David had arrived with their beautiful four-week-old baby, Skye, the newest addition to the WWRG. We were in position in cars behind some bushes at 06:30 hrs, the Lincolnshire team met us there because of the potential of a big catch. About 30 Curlew landed in the ploughed field but only eight were in the catching area. 50 Bar-tailed Godwit landed in the stubble field next to it. Lots of Knot wanted to go in the stubble but didn’t stay or settle. We elected not to fire and to come back on Friday instead and put extra nets in the stubble. We later found out the stubble field still had a crop on it the previous day when the recce was done, explaining why the birds that came in had changed their preferred field. Our cars were very close to the RSPB reserve so a group led by Rob P went off to get colour ring resightings at the Pits, then onto Snettisham beach where the Curlew and Black-tailed Godwits were close enough to read rings for about an hour after high tide. The rest of the team went back and after breakfast some went back out to set a clap net pair in the stubble field to increase the catching options. Emily strimmed a large area of the stubble in front of the net to make it more attractive for birds to land. At base Tim and Dave did some great work fixing the toilet plumbing (and my car key that had fallen apart – thank you Dave). Eve, Francis and Sabine continued to work on the weeding the patio while Michele, Rob, and Graham tackled some data checking. Dinner was a fantastic pie: steak and mushroom or sweet potato and spinach. 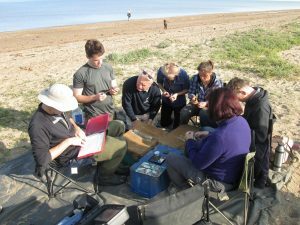 Jenny, Lynne and Rob P went back to Snettisham beach for more colour ring resighting on the evening tide while Emily organised a team to make orange colour-rings for the Curlew. The Lincolnshire team met us on the Sandringham Estate field again. Those watching from the cars were treated to the sight of 1,000s of Knot in the air, spiralling down into the Pits. In the stubble field the Curlew arrived quite quickly and then continued to dribble in. A small godwit flock arrived, the birds were settled and the firing team waited in hope of more godwits. As it neared high tide a Buzzard called and the birds heads went up, a quick decision was made to fire and there was a nice catch of 38 Curlew, 61 Bar-tailed Godwits and a couple of Knot. Everything was covered quickly with material to keep the birds calm before they were extracted. We set up three colour-ringing teams and two processing teams and all birds were flagged. Many of the godwits were still in summer plumage. It was a hot day and we used the cars and a tarpaulin to shade the keeping-cages. In the afternoon a team of setters went down to the Terrington Marsh and set two lines of mist nets, over the E pool and another at the cannon-netting pool. When we went back out with the tape lures it was already getting dark and we started catching straight away. It was an excellent catch with a range of species and at this time of year, as birds are moulting out of summer plumage, the processing and ageing was very interesting. We finished about 01:30 hrs and hurried off to bed for a very early start the next morning. 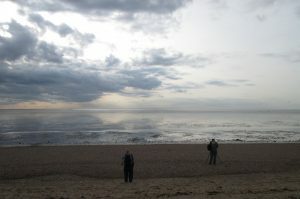 The team headed out early Saturday morning to set two small-mesh nets on Heacham Beach. The nets were set quickly and the hide team got into place while the rest of the team settled behind the sea wall. Instructions were heard over the radio to settle down as we may be waiting for a couple of hours, although most of the team were half asleep already! One net was fired and birds were lifted safely and quickly. The birds were processed and the smaller catch allowed for some measurement training and double wing measurements to be taken. We all returned for breakfast and then the decision was made to mist net again at Terrington instead of Gedney on Saturday evening. A team set out in the afternoon to set the nets; two groups of nets were set again, one around the E pool and another around the cannon netting pool. A smaller catch was taken than the previous night, however, with nearly all birds caught on the cannon-netting pool. It was a great night to be out on the marsh with it being so calm and clear. The birds were brought back to the barn and the Curlew, Godwit and Whimbrel were processed first and released. The nets were then closed and we began to process the rest of the birds. Left over banoffee pie was one of the breakfast options for the last morning. The trailers were emptied and all the kit put away, the house and annex was tidied and everyone began to head off home. An excellent week and thank you to everyone involved. Over the course of the main fieldwork week, we recorded over 200 re-encounters of Curlew and Bar-tailed Godwit, previously marked by the group, including 88 individual Curlew and 57 individual Bar-tailed Godwit. This exceeds the minimum required threshold to perform robust survival analyses on the autumn passage population using the Wash. The combination of re-sighting data and field catches of these two near-threatened wader species means the group has survival data for Curlew and Bar-tailed Godwit running back almost 60 years. The total number of encounters of marked birds exceeded 250 when birds marked by other groups are taken into account. These mostly comprise over 35 Black-tailed Godwit encounters, but other highlights include a Norwegian flagged Bar-tailed Godwit, a Dutch flagged Bar-tailed Godwit and an infamous Avocet with identity issues roosting among a flock of several thousand Oystercatcher for the fourth year in succession.